Well we've all been there..
to post PICS to the forum, once you get the first one or two under your belt. 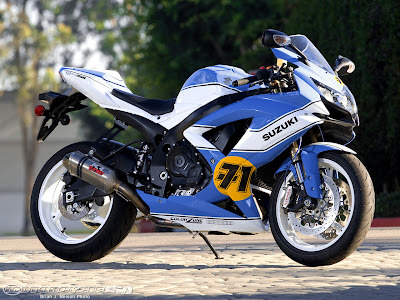 My test pic came from a google search of " Suzuki motorcycles racing ." RIGHT Click here --> to open up a REPLY TO this post in a separate Window. Only have the 2 windows open, This Post and Your Reply Post.....close all others. NOW RIGHT CLICK the pic below, and select " Copy IMAGE address "
GO TO Your Reply Post and select "[ img ] [/ img ]" tags from above post window. And once pasted into YOUR REPLY post ..it should look like this..
and write "Thank you Jaz, cheque is in the post".... and hit SUBMIT. And THAT is how you post pics into YOUR posts from anywhere on the web. NB...please be aware that some pictures/sites WILL be copyrighted, so please respect that. i'd liken websites to peoples houses or clubs. If you invite people to your house or club and your pics are locked in a draw, (aka your pc) no one can see them..
POSTIMAGE and similar, are those walls for the sake of online pics. and of course once posted anyone else can copy and place them anywhere they choose, as well..
nb:poor attempt, so change video setting from hd 720 to 360 quality for best vewing. If you have already got google drive, why not try it and see how easy it can be. Go to YOUR Google drive account and hit 'NEW' top left. and choose the PIC above to Upload. this now puts THAT pic on your clipboard ready to paste. Now GO TO Your Reply Post and select "[ img ] [/ img ]" tags from above post window. Find that picture and right click it. drop down list should have "copy image location"
this will place an [ img ] [/ img ] tag where ever your cursor last was inside post. OR place your cursor inside [ img ] [/ img ] and right click, select paste. Pic should now be showing in your post. to check preview post and admire. Ollie has kindly added a link to reduce IMAGE sizes. [ fimg= ] tags offer a good choice to allow you to post larger pictures into a smaller format. for example the largest pic at bottom of this post is at 2048. Now bigger IS nicer... but it will not look so good to others using the forum as they read through the post..
Last edited by jaz66 on Sun Jan 25, 2015 1:18 am, edited 1 time in total. Aha - so you don't need to save the image to your postimage account in order to put the pic in your thread? You do if it's only on your hard drive, you can only link to elsewhere on the interweb thingy so that's why you have to upload your own pics to Postimage (other file sharing sites are available). so any website you find on-line..you can usually post the pics from there, onto here for discussion, etc. so it could be another forum, or a blog or a any googled site you found..the world is your oyster..
(bigger shot) and post THAT if you wanted to..